Roach Control | Roach Exterminators | Westchester, NY. QualityPro can help you with any type of roach control issue you may have in your home or business. Roaches are a very versatile insect. Roaches live in just about every single climatic conditions. Roaches do well in most any condition. Roaches love to get into your homes to build their nests. Fear of roaches is common. Guests or customers may be scared off by the site of a roach in your home or business. Roaches will live on almost anything. Once they find a food supply in your home, it is difficult to eradicate them from their nest. Roach control can be difficult for a homeowner to manage. They can build large nests which can be difficult to locate. Our professionals are trained to use the newest and safest pesticides to help you exterminate your roach problem. Call our experts at QualityPro roach control can help you to track and exterminate these pests for you. Don’t let roaches destroy your home or business, call for an inspection today. Roaches can be a real problem in your home or business. QualityPro can help you manage this problem. The will find the source of your roach infestation problems and eliminate the roaches. Roaches are quick breeding insects and if they are left untreated you can have a large roach infestation problem on your hand. We will eliminate the roaches and set up a management program to ensure that they don’t return. If you notice any of these signs, they may be an indicator that you need to call in a roach exterminator. We can help you with an inspection of your home and let you know if you have a roach problem. QualityPro can help you with your roach management problems. They will inspect your home and let you know what type of problem that you may have. they will suggest the type of extermination that would be best for your home. They will work to seal up your home from these pests. They will exterminate the roaches that you can see and eliminate them from their nests. 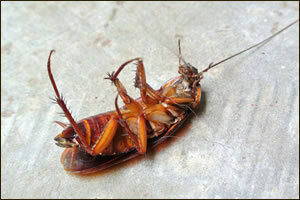 They can also help you with any odor control problems created by the live and dead roaches.